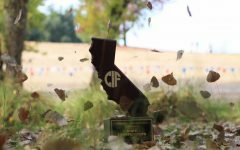 A majority of the 2018 girls’ cross country seasons came to a close on Friday, Oct. 26 with a league meet at Guajome Park. The seniors not continuing their season received a final send off to wrap up their final year of cross country in high school. 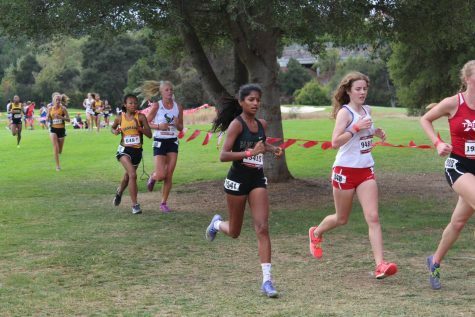 Lavanya Pandey races at the Stanford Invite on Sept. 29. Most of cross country finished the season on Oct. 26. Certain races throughout the cross country season act as qualifiers for either continuing the season or causes promotions and demotions onto the three different levels of competition (varsity A, varsity B and junior varsity). The league meet at Guajome Park held high importance for the girls racing because how well one raced determined if their season would continue or if this would be the last time tying their racing flats this year. The Bobcats finished in first place for Division 4, with the front-runner of the team, senior Brooklynn Deal, coming in at 12th in the varsity 5k with a time of 20:43.5 and senior Alexis Petty finishing at 24th with a time of 22:05. Friday’s race at Guajome marked the end of an era for most of the seniors on the team, and this brought a lot of emotion to the surrounding course and to all of those both racing and cheering. “It’s definitely sad. A lot of them have been on the team for four years so it’s definitely sad to see them leave. The good news is we still have track so it’s kinda like bittersweet, they’re done with cross country, we still get to see them in track so we give them a big ceremony,” cross country coach Jacob Feiring said. Some seniors, however, moved on after competing that afternoon on Oct. 26. With her running career not concluding any time soon, Deal is still battling thoughts of leaving all of those that she has trained with for what feels like forever. “It’s very emotional, I’ve been with the same people for four years so it’s gonna be really hard to leave them,” senior Brooklynn Deal said. With state on the horizon at the time, Coach Feiring was hopeful of what was to come. “I think the season’s going great. Really proud of these guys. They’ve been working hard all season, we have four weeks until state, boys are ranked third in the state of California and girls are ranked first for division four so we’re looking really good. We’ve both been climbing the ranks as the season progressed and we’re right in a good spot right now and I want to keep that momentum moving forward,” Feiring said. With that being said all of the runners have put in commendable work this season and have earned their spot for state and further meets to come. Some of these runners have been committing for years. “I’ve been running cross country since sixth grade,” senior Alexis Petty said. The meet itself at Guajome was like usual cross country meets: hot, long and dust flying every which way. Towards the end of the meet before packing up the bus, the team’s senior night took place. All runners gathered surrounded by friends and family. Senior runners were commended for all of their hard work throughout their cross country careers in high school and their overall immense dedication to the team and the sport. “It was really good, super hot, but it was really fun,” Petty said.